Having a backyard swimming pool can be essential when you live in South Florida. Having someplace you can go for a quick dip to escape the region’s hot and humid weather can make living here easier. But one of the biggest problems with owning a pool is safety. A backyard swimming pool can be a hazard to people who don’t know how to swim, to toddlers, and to pets. So it’s essential that you supervise your pool to prevent accidents. The problem is that most people can’t be there to watch their pool 24 hours per day, 7 days per week, 365 days per year. 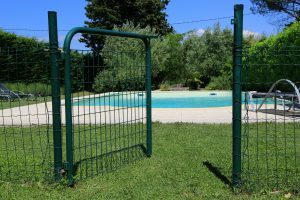 So how can you ensure that your pool is always available when you want to use it but at the same time keep it safe from unwanted users when you aren’t around? A pool fence can block access to your pool to everybody except those people you want to use it. It creates a barrier between the hazard of your pool water and the outside world, preventing pets, children, and unwanted guests from gaining entry when you aren’t around. Pool fences are easy and fast to install and provide 24-hour protection for your pool so you never have to worry about accidents occurring on your property. They are safe, convenient, and effective at protecting both your pool and your property. Eagle Pool Service is experienced at installing safe, secure, and protective pool fences for both in-ground and above-ground pools. With just one phone call you can ensure that your pool is safe around the clock without having to provide any additional supervision. Owning a pool is a lot of fun but it also comes with a lot of responsibility. Make your pool and your home safer with a pool fence from Eagle Pool Service.